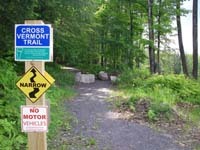 What does it mean to say the route of the Cross Vermont Trail is a "patchwork quilt"? The route is stitched together from many pieces. The character of any one piece may vary greatly from that of the sections before and after. The guidebook and cue sheets include summary descriptions of type of trail and treadway surface you can expect. Read on below for examples of what is meant by the summary descriptions used in the guidebook. 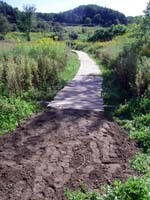 In addition to bicycles and pedestrians, portions of the route are appropriate for other trail users. 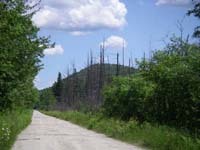 In the winter, some of the route can be skied or snowshoed (including several sections coaligned with snowmobile trails maintained by local clubs of the Vermont Association of Snow Travelers). 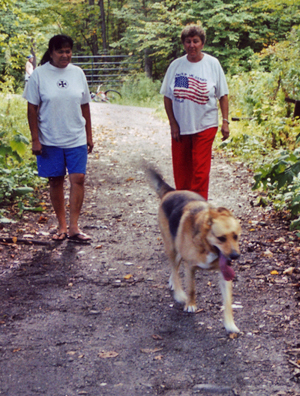 Some sections of the former railbed are popular with equestrians. Paved shared use paths in more urban areas work well for other sports like blading. 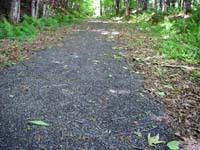 Gravel surface trail built from former railroad bed. 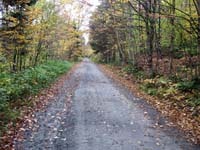 Former railbed maintained as town trail. 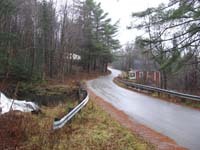 Former railbed maintained as town road. Rough treadway including some large size gravel (ballast?). 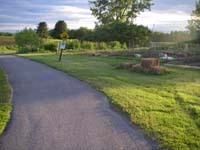 Unpaved Paths, firm dirt surface and mown grass. Portions of the trail are on firm, smooth hard packed dirt with mown grass. These surfaces can comply with "accessibility guidelines" and can be bicycled on. It may be rough for a skinny tire road bike. By the way, help us out by letting us know if you come across a section of trail that is in need of a fresh mowing. Treadway formed by firm dirt and mown grass. Paved shared use paths are what many people think of when they hear "bike path." 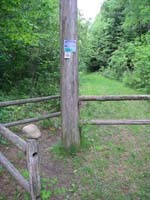 The Cross Vermont Trail in Montpelier and in Chittenden County consists primarily of paved paths. 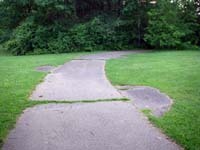 Paved path, not always completely smooth. Trestles, Puncheons, Bridges, and Boardwalks. Chicanes, Bollards and other frustrating structures. In some places you will encounter structures which purposefully make the trail narrower and more winding. Usually the reason is to block motor vehicle traffic in locations where the land owner wishes. Much of the route is designated on town roads. Mostly, these are quiet, scenic and rural. 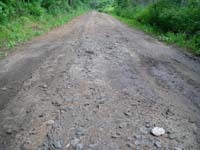 The surface of a typical "dirt road" is firm and smooth, but may be a little rough for a skinny tire road bike. 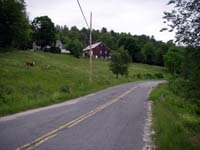 In Chittenden County, larger towns (cities) have larger roads, with painted bike lanes. Passing through village centers and business districts. 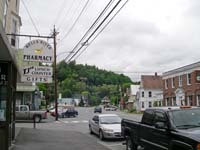 One of the neat things about a state wide trip on the route of the Cross Vermont Trail is passing through a sequence of village centers and business districts. 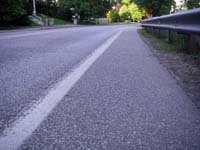 Expect heavier pedestrian traffic, and cars parked along the shoulder of the road. Currently, some of the route is designated on Rte 302, Rte 2, and Rte 100B. (Technically, they are U.S. highways). 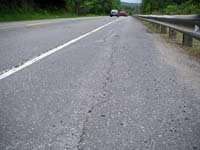 These larger roads are paved and regularly maintained. Expect auto traffic to be heavier and moving faster. The width of shoulders varies. Remember, it is appropriate for bicyclists to ride in the regular traffic lane, as long as they follow the rules of the road.